North America is leading the market with a share of over 62% in the year 2016. The growth of the market is attributed to the supportive administrative efforts by the government authorities for the recreational use of the drones. The high disposable income of the population in the region also aids in the market growth. Moreover, increasing investments in the drone technology along with the supportive administrative support will foster the market growth. 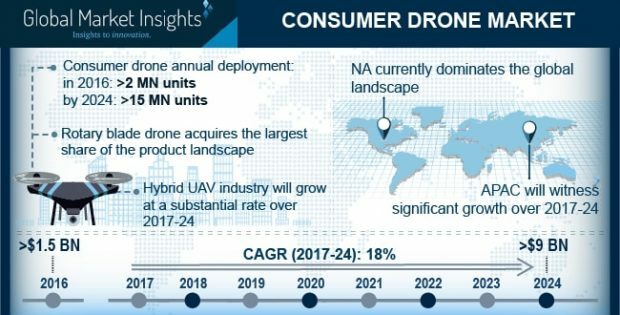 Consumer Drone market is projected to exceed USD 15.0 billion by 2024. The growth of the market is driven by the rising awareness and availability of the drones across the countries. The population of the countries is increasingly adopting drones as a widely accepted hobby. The integration of AI and development of collision detection technology are also estimated to have a significant impact on the growth of the market. However, the stringent government regulations associated with the use of drones for recreational purposes and the low battery life of the consumer drones are holding back the market growth. Previously, UAVs were known as a sophisticated military technology and used only for combat operations. However, technological advancements in the technology have developed several new consumer and commercial applications. 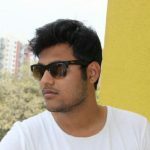 The technological advancements and the decline in the price of the components have also attracted the several industry verticals, such as gaming sector, to adopt UAVs for augmented reality games and racing purposes. The rotary blade drone is estimated to account for more than 85% revenue share in the year 2016. The growth of the market is attributed to the robustness and high durability of the rotary blade drones as compared to other variants. The increasing adoption of the rotary blade drones for the photography and racing applications is also estimated to have a significant impact on the growth of the market. Hobbyist/Toys market is estimated to grow with the growth rate of 25.4% during the forecast period. The increasing adoption of drones for aerial photography and gaming purposes is estimated to be the primary factor driving the growth of the market. Moreover, the advancements in the drone technology and the decline in the price of the drone also drive the adoption of the drones among the population across the countries. Asia Pacific is estimated to grow with a CAGR of over 27% during the forecast period. The strong presence of China in the consumer drone market is driving the market growth. The Chinese drone manufacturer, DJI, held the maximum share in the consumer drone market. Yuneec International and Walkera Technologies also contribute significantly toward the market growth. Furthermore, the increasing awareness and adoption of the drone in the other Asian countries including India and Australia are also estimated to drive the market growth. Major vendors of the consumer drone market are 3D Robotics, Parrot, DJI, Walkera Technologies, Shenzhen Hubsan Technology, Cheerson Hobby, Hobbico, Inc., SYMA, Horizon Hobby, SkyTech, Jianjian Technology, UDI RC, Mota Group, and Meijiaxin Innovative Technology.